When you leave your children in the care of someone else, including a daycare, you need to be able to trust that they will treat your children well and that they will be safe until you come to pick them up at the end of the day. Unfortunately, this is not something that is necessarily true for every daycare provider. While you should fully vet any place that you are considering as your daycare provider, there may still be some issues that occur even after you have started using their services. If you have had incidents that don’t seem right, you may need to consider is now is the time to not only take your child out of daycare but also if now is the time to contact a daycare injury lawyer. These are some signs that you may need to do exactly that. Unusual Marks on Your Children – If you notice that there are any unusual marks or injuries on your child and it happens frequently without explanation, there may be a serious issue. Typically, if something like this arises, the provider should be able to explain the issue, such as a specific accident or some other logical explanation. Changes in Their Behavior – If your child or children start showing more aggressive behavior, it is something worth looking into. Additionally, while they may not like going to daycare at first, if they start begging your every day to not go and or act as though they are frightened you should listen to them. Acting Out in a Sexual Way – If you notice your child making any sexual references or acting out sexual acts, this is a major red flag and something to act on immediately. Not only should you contact a daycare injury lawyer but you should also take your child to your pediatrician immediately. The Daycare Looks Dirty or Dangerous – This is something that you should keep an eye on. If things start looking like they are not cleaned regularly or something seems dangerous, you want to make sure that you report it and contact an attorney to help you take the right steps. If you think that you should get in contact with a daycare injury lawyer, you want to find one that will fight for you and your rights. Be sure to reach out to us today to get started and schedule a meeting to determine if you have a case. What is Underinsured Motorist Insurance Coverage? Do you have UIM Insurance? Underinsured (UIM) motorist coverage insurance above and beyond the at fault driver’s insurance if that amount does not compensate you for your car accident injuries. South Carolina law requires that all motorists maintain at least $25,000 in liability insurance. Sometimes medical bills from a car wreck exceed the $25,000. If you have UIM insurance then you can request additional compensation from that UIM policy. How Do I know if I have Underinsured Motorist Coverage? Underinsured motorist coverage is not a requirement. It is an additional level of insurance coverage that you elect to pay a premium to have on your vehicle. While liability insurance is required, UIM is not. Many times a person does not elect to have this additional coverage. In order to determine whether or not you have underinsured motorist coverage to protect you in a South Carolina car accident, you can look at your insurance card, look at your policy and the declarations page, call your agent or call your insurance company. The cost for UIM insurance is usually pretty inexpensive so it may be a good thing for you to add. Stacking insurance is when you have multiple vehicles with UIM insurance. If your damages exceed the first UIM policy you can then “stack” the policies for each of the remaining vehicles assuming they all have UIM insurance. 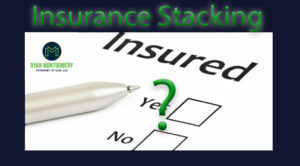 The Court has held that “stacking refers to an insured’s recovery of damages under more than one insurance policy in succession until all of his damages are satisfied or until the total limits of all policies have been exhausted.” State Farm Mut. Auto. Ins. Co. v. Moorer, 330 S.C. 46, 60, 496 S.E.2d 875, 883 (S.C. Ct. App. 1998). Many people injured in a car wreck or trucking accident do not know they can stack insurance. Even if they know they can stack insurance they don’t necessarily know how to do it. An experienced car accident or personal injury lawyer can assist with determining whether or not your injuries and damages rise to the level of needing to be stacked. In order to protect your case, many people choose to have a free consultation with a personal injury lawyer just to find out their rights. Knowledge is power in these circumstances. Often you are dealing with an insurance adjuster that is trying not to pay you the most benefits or to allow you to stack your policies. Do yourself a favor and meet with an experienced personal injury lawyer. There is no obligation so why not at least know your rights? With offices conveniently located in Greenville and Columbia we can offer a free consultation to you to discuss your injury case issues. Can My Workers’ Compensation Claim Be Denied for Intoxication? Intoxication is a condition that results from the use of a stimulant, which renders an employee impaired in his or her faculties to the extent that the employee is incapable of carrying on the accustomed work without danger to the employee. Reeves v. Carolina Foundry & Mach. Works, 194 S.C. 403, 408, 9 S.E.2d 919, 921 (1940). Intoxication is an affirmative defense which requires the party asserting the defense to carry the burden of proof. Chandler v. Suitt Constr. Co., 288 S.C. 503, 504, 343 S.E.2d 633, 634 (Ct. App. 1986). What the insurance company doesn’t tell you is that they (NOT YOU) must prove that but for the intoxication the accident would not have occurred. Many times drug tests show the presence of a drug. However, they do not show the levels of the drug and when the drug entered the system. Your claim will be denied and you won’t know whether or not you can file a claim. We recently handled a case that had a positive drug screen. Another high volume law firm wanted no part of the case. We took the test results and sent them to a toxicology expert that pointed out all of the problems with the test and there was no proof that the alleged intoxication caused the accident because the other driver was at fault. If you aren’t willing to go against the insurance company lawyers or think you need help then our South Carolina work comp lawyers offer a free consultation. You will get a real meeting, go over your rights and then you can make a decision whether you need a lawyer or not. Schedule your free meeting now.